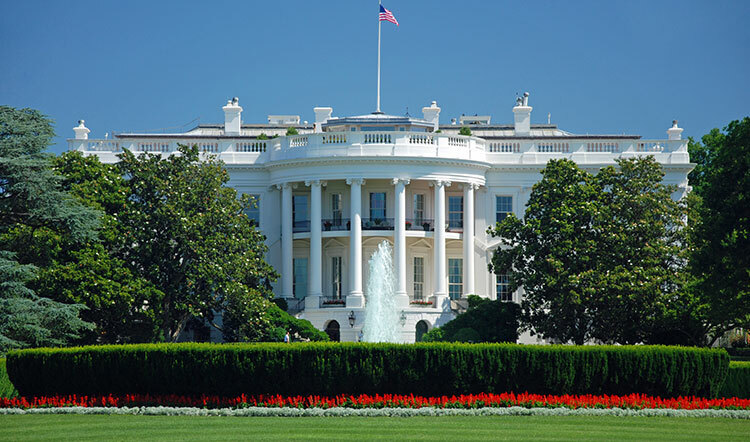 Experience The White House's stately grandeur, elegance and rich history by walking its storied halls. Although touring The White House takes a bit of planning with your Member of Congress, exploring the Executive Mansion's East Wing is to step into American history. Visit the State Dining Room, where dignitaries and world leaders have discussed politics and dined for over a century. Explore the exquisite tableware of the China Room, with fine china dating back to George Washington, then visit President Jefferson's personal drawing room, the Green Room. For those unable to book a tour, The White House Visitor Center offers guests an interactive touchscreen tour and features over 90 artifacts from the Executive Mansion's collection. What items are prohibited from The White House? To take a public tour of The White House, it's important to know what items could keep you from participating. Backpacks, purses and handbags are not allowed inside, so it's important to plan accordingly. Strollers, food and drinks, tobacco products, video cameras and personal grooming items (lotions, makeup) are also not permitted. As of July 2015, guests are now allowed to carry smartphones and compact cameras with them during the tour. What documents do I need in order to visit? Along with the items not to bring, there's also items you must present in order to tour The White House. To gain admittance, visitors must present a valid, government-issued identification card, such as a drivers license, military I.D. or identification card. A valid United States passport and other official, government-issued passports are also acceptable. How do I schedule a White House Tour? Why Stay at Washington Plaza Hotel?